Hand-crafted in Japan featuring an original carved body design.Feature includes Aria Pro II original..
Hand-crafted in Japan with original carved body shape.Feature includes Aria Pro II original parts, Q.. Featuring a beautiful curly grained Ash body stained in gold. Aria Pro II “LUX series” guitars are h.. 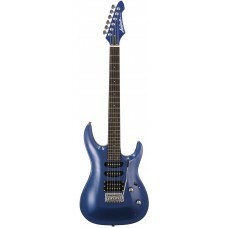 Double cutaway design, carved body top and rich variation of pickup selection made Aria MAC-Series a..